So, you can manage your group according to the rooms available. Harvest Moon Guest House was established in 2000 which is situated just a five minute walk away from the main tourist strip(Lakeside) and Fewa lake to offer a nice, clean, quiet, family oriented accomodation for tired and weary tourists as well as those looking for adventure.We are just 1.5 km far from the tourist bus station and 2.5 km far from Pokhara Airport. Harvest Moon is the tweintieth studio album by Canadian musician Neil Young, released in 1992 from which the guest house was named.The Proprietor of the guest house, Mr. Hari Shrestha has always been a huge fan of Neil Young. Offering a small restaurant we have been providing free WiFi access in each and every rooms. 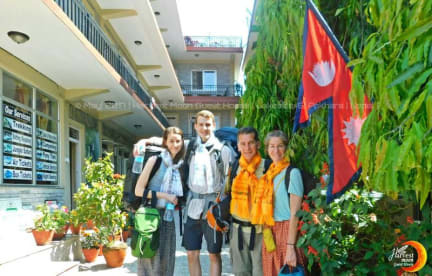 The rooms are well furnished and it is provided with soft spring mattress with the attached bathroom featuring a hot shower .Some rooms include the private balcony too.You can have a excellent view of the Annapurna Range and the Machhapuchre mountain from our roof top terrace.